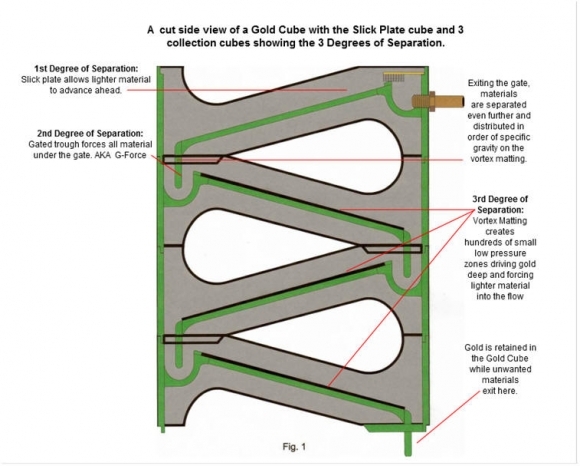 Move an amazing amount of material through the Gold Cube..up to 1,000 lbs. an hour...even black sand and end up with a coffee cup (or less) of super concentrates.. now that's time well spent! Active Vortex Zones gravitate the heavy gold downward thus forcing out lighter materials, even black sand! Each modular tray contains thousands of these "tornado zones" that continually purge.. you will always keep the gold while removing almost everything else automatically! Go ahead and feed the Gold Cube, it's a very hungry machine. Stack-able and durable trays are made of "low density Poly" similar to your cutting board at home and fill about the same footprint. This makes the Gold Cube very compact yet tough and ready for any situation you can throw at it. Everything on the Gold Cube is ready for action..Simply set it up, hook up the 12 volt pump and you're ready to go! You can pump from a creek or recycle from a tub. Why bring home the creek when all you want is the gold? That's why we say; "Cube it or lose it!"